Déanann an Bord Bainistíochta bainistiú ar an scoil thar ceann an phátrúin agus tá sé freagrach don phátrún agus don Aire. Ní mór don Bhord seasamh le sainspiorad (éiteas) na scoile agus tá sé freagrach don phátrún as a leithéid a dhéanamh. 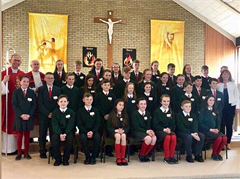 Tá an príomhoide freagrach as bainistíocht laethúil na scoile, agus as treoir a thabhairt do mhúinteoirí agus do bhaill foirne eile na scoile agus tá sé/sí freagrach don Bhord as an mbainistíocht sin. The Board of Management manages the school on behalf of the patron and is accountable to the patron and the Minister. The Board must uphold the characteristic spirit (ethos) of the school and is accountable to the patron for so doing. The principal is responsible for the day-to-day management of the school, including providing guidance and direction to the teachers and other staff of the school and is accountable to the Board for that management.